In March, many of my colleagues and I, were asked to answer some questions about what it is like to be either a women in science or a women in art. I am lucky enough to be one of the few who was highlighted as both a women in science and art. I highlighted some of my answers below and you can read the full blog post here on the Field Museum’s website. I received a BA in chemistry and fine art … from Lewis University in Romeoville, IL, in 1997. ….It wasn’t until I went back to the School of the Art Institute of Chicago …. that I was introduced to the vast collection of material and specimens here. While at SAIC, I started at the Museum as an intern with Bill Stanley, … then in 2005, I became a full-time research assistant. 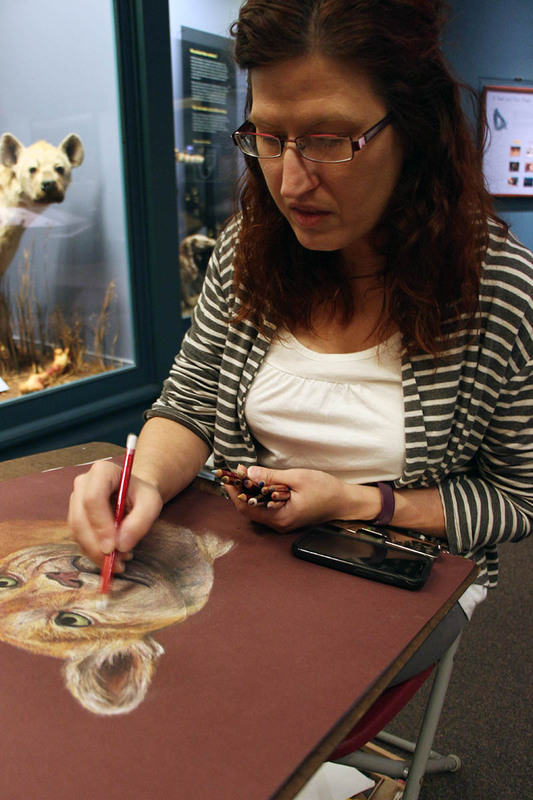 In 2015, the collections assistant, mammals preparator position opened up … and that is how I got to where I am now. 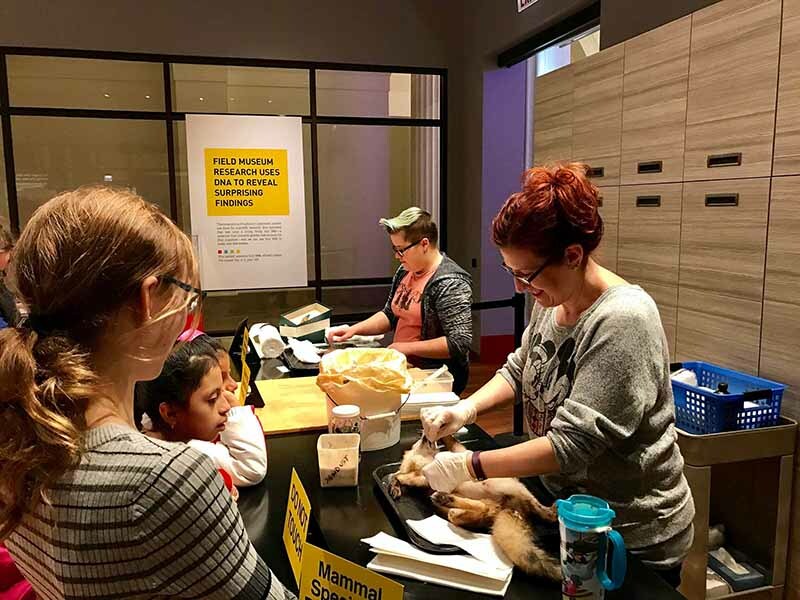 Teaching visitors about mammal preparation at Meet a Scientist in the Science Hub. Photo copyright the Field Museum of Natural History. What does your job entail? What’s the day-to-day like? Part of my day-to-day includes working with the dermestid beetle colony that cleans specimens … I also supervise volunteers and interns. I train them on different tasks like skinning, stuffing skins, and cleaning and numbering bones … how to use the camera equipment and the camera lucida for illustration, and help them get involved with different research projects. One of the projects we’re working on now is photographing the skulls of Grammomys (a group of rodents found in Africa). … Other tasks for similar projects have been to photograph or illustrate a specimen or create maps and graphs that my colleagues or Field Museum researchers may need for publications. … Other projects might include processing specimens that a researcher brings back from an expedition. …..
One of my proudest moments was the day that Bill Stanley came down to my office and was holding the new Fieldiana (a scientific journal published by The Field Museum) that had various articles about the small mammals in the East and West Usambara Mountains in Tanzania. …. The other moment was when one of my colleagues and a researcher at the Smithsonian, Mike Carleton, asked if I wanted to be an author on a paper about a new species of rodent in the Hylomyscus genus. …..
I’m not a proponent of STEM, I’m a proponent of STEAM (Science, Technology, Engineering, Art, and Math). … Like the sciences, the arts also do not have enough representation by women. … Art does help with science; they work together. … Science and art work together. Next the daily grind at work: What do I do at work? Well, you can find out in the next post. Stay tuned.